It’s that time of year where students are perfecting their portfolios, practicing their firm handshakes, and picking out their best business-professional attire. What does all of this mean? 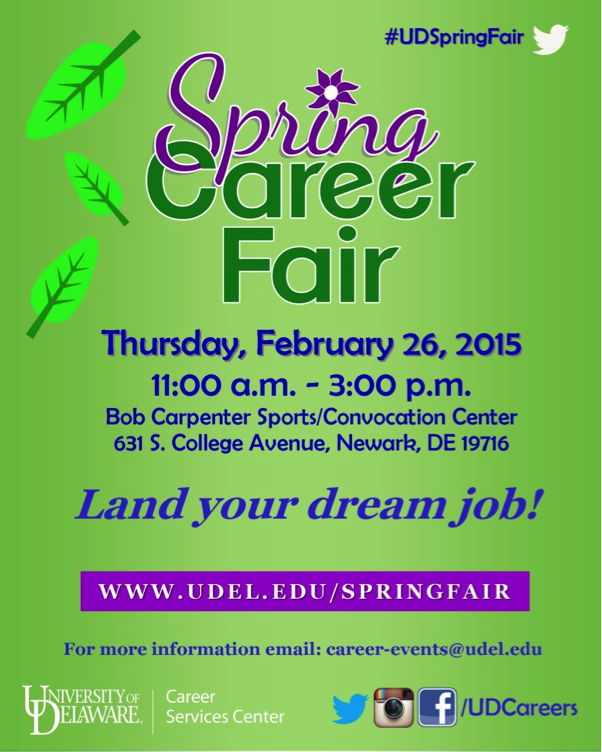 The annual Spring Career Fair is fast approaching! Before joining the throngs of students journeying to the Bob Carpenter Center with resumes and business cards in hand, you need to prepare for what’s awaiting you at the fair- after all, students only have a few minutes to make a huge impact on each recruiter they meet. Luckily, the Career Services Center staff has some tips to ensure you walk through the doors of the Big Bob ready to make the most of this year’s fair. Attending career fairs can be intimidating when thinking of all the students across campus earnestly preparing just like you- all for the chance to stand out against their professionally-clad classmates. But if you keep these tips in mind, come Thursday you will walk into the Big Bob with confidence and walk out knowing you took advantage of every opportunity the Spring Career Fair has to offer UD students! Previous: Previous post: What’s to come for Spring 2015. Next: Next post: Let’s Talk Disney.